Mobile Wallet Terms and Conditions - These Terms and Conditions (the “Terms”) apply when you choose to add an ISPFCU credit card or debit card (“ISPFCU Card”) to a Mobile Wallet Service. In these Terms, “you”, “your”, “their”, and “my” refer to the cardholder of the ISPFCU Card, and “we,” “us,” “our,” and “ISPFCU” refer to the issuer of your ISPFCU Card. By selecting the check box entitled “I have read, and I understand and agree to the ISPFCU Mobile Wallet Service Terms and Conditions,” you agree to all terms, conditions, and notices contained or referenced in these Terms and you are providing your express consent. What is a Mobile Wallet Service? A Mobile Wallet Service (“Wallet”) allows you to add your ISPFCU Cards to an application using your Mobile Device. Your ISPFCU Card number is replaced with a digital number or token. Once added, you understand that you may use your Mobile Device to make payments only where the Wallet is accepted. ISPFCU is not a provider of the Wallet and we are not responsible for any failure or inability to perform a transaction using the Wallet. We are only responsible for supplying information securely to the Wallet provider to allow usage of the ISPFCU Card in the Wallet. Eligibility - Active ISPFCU Card accounts that are in good standing are eligible to be added to a Wallet. If your ISPFCU Card or any underlying ISPFCU account becomes delinquent, is in a negative status or is otherwise maintained in an unsafe manner as determined by ISPFCU in its sole discretion, your ISPFCU Card may be removed by ISPFCU from the Wallet for continued use. Relationship to Other Agreements - You agree that when you add your ISPFCU Card to a Wallet service, your ISPFCU Card and account will remain subject to the terms and conditions of all existing agreements with ISPFCU. You acknowledge that certain message and data rates may apply from your wireless service providers and/or wireless carriers which might impact your use of the Wallet. For example, your mobile service carrier or provider may impose data usage or text charges for your use of or interaction with the Wallet, including downloading the software, receiving or sending text messages, or other use of your mobile device when using the software or other products and services provided by the Wallet. You expressly agree that you are responsible for all such fees, limitations, and restrictions and that we may contact you via your mobile device for any purpose concerning your accounts at ISPFCU, including account servicing and collection purposes. Account Ownership/Accurate Information - You represent that you are the legal owner of the account and other financial information which may be accessed via the Wallet. You represent and agree that all information you provide in connection with the Wallet is accurate, current, and complete, and that you have the right to provide such information to us for the purpose of operating the Wallet. You agree not to misrepresent your identity or your account information. Changes in these Terms and Conditions - Except as otherwise required by law, ISPFCU may in its sole discretion change these terms, and modify or cancel the eligibility to use your ISPFCU Card with a Wallet service at any time, without notice. You cannot change these terms but you can terminate them by removing your ISPFCU Card(s) from the Wallet. 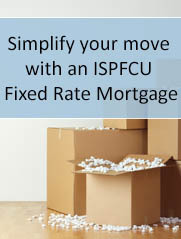 ISPFCU reserves the right to refuse any transaction for any reason. Exclusion of Warranties; Limitation of Liability; Indemnification YOU EXPRESSLY UNDERSTAND AND AGREE THAT YOUR USE OF A MOBILE WALLET SERVICE IS AT YOUR SOLE RISK. ANY MATERIAL DOWNLOADED OR OTHERWISE OBTAINED THROUGH THE USE OF THE WALLET IS OBTAINED AT YOUR OWN DISCRETION AND RISK, AND ISPFCU IS NOT RESPONSIBLE FOR ANY DAMAGE TO YOUR MOBILE DEVICE OR LOSS OF DATA THAT RESULTS FROM THE DOWNLOAD OF ANY SUCH MATERIAL, WHETHER DUE TO ANY COMPUTER VIRUS OR OTHERWISE. ISPFCU MAKES NO REPRESENTATION OR WARRANTY AS TO THE COMPLETENESS, ACCURACY, RELIABILITY, OR CURRENCY OF ANY INFORMATION OR DATA THAT YOU OBTAIN THROUGH THE USE OF A WALLET.